Register RaidenHTTPD at low price, detailes: CHECK! RaidenHTTPD 2.0.44 is released, now includes PHP 4.4.9 / 5.2.17 / 5.3.13 and VirtualHost bandwidth restriction, VirtualHost expiration, Automatic watermark over refered images. 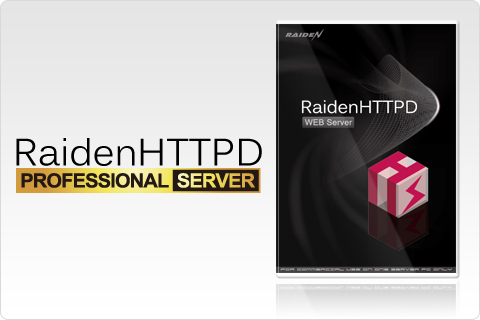 Web server software - RaidenHTTPD is a fully featured web server software for Windows platform. It's designed for ANYONE, whether amateur or expert, who wants to have an interactive web site running within minutes. With RaidenHTTPD, everyone can be a web site magician from now on! Having a web site created with RaidenHTTPD, you won't be suprised to see thousands of visitors to your web site every week or even more! RaidenHTTPD web server is designed to help you setting up a web site with minimal efforts. It does not require you to spend hours to configure. With its friendly graphical-user-interface and concise step-by-step instruction wizard, everyone can create a powerful, secured, and interactive web site. RaidenHTTPD is able to deal nicely with dynamic pages base on PHP (ISAPI high speed version) or CGI scripting languages. In another words, constructing a fully dynamic web site, such as a discussion forum, a photo gallery, or even a portal site, is no longer a nightmare! RaidenHTTPD web server team has been continuously calibrating RaidenHTTPD's memory usage and performance upon program execution. Thus, RaidenHTTPD is able to achieve what other world-famous web server applications can do for you. We not only support the popular security schemes on the market such as the SSL/TLS connection, IP checking, and Anti-Hammer/Virus but also provide a built-in anti-referral linking mechanism in order to block out any unauthorized use of your web site.